This report is from The Sydney Morning Herald, Australia 7th April 1913. It adds information to our other articles about ginger in HK. “There has been a general increase in the export of preserved and candied ginger from China during the past few years, the United States particularly showing a growing demand for this sweetmeat. Exports during the past three years have averaged in value about £25,000 per annum, practically all of which has been shipped through Hongkong. Of these total exports about 25 per cent on an average come from the country about Shanghai and through that port, about 6 per cent, through Swatow, and nearly all the rest through Canton. The root is exported from China in considerable quantities,in no other form than as preserved or candied root, known respectively as “in syrup”or “dry ginger.” The preserved form includes not only ginger itself, which has been peeled, boiled, and preserved in syrup sugar,but also mixed preserves of ginger, kumquats (very small oranges), melon rind, and the like, which are prepared in substantially the same manner, according to tho United States Consul-General at Hongkong, as ordinary fruit preserves are prepared in America. “Dry” or candied ginger is merely the root, which resembles a small, somewhat gnarled sweet potato in appearance, prepared by being peeled and preserved in strong syrup, and then dried in the sun. 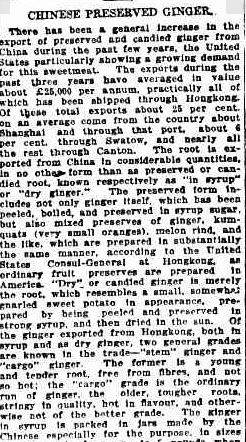 Of the ginger exported from Hongkong, both in syrup and as dry ginger, two general grades are known in tho trade-“stem” ginger and “cargo” ginger. The former is a young and tender root, free from fibres, and not so hot; the “cargo” grade is the ordinary run of ginger, the older, tougher roots, stringy in quality, hot in flavour, and other-wise not of tho better grade. This article was first posted on 9th February 2014.